Do you have a string of events—weddings, debuts, big dinners—to attend in the next few months? Chances are, you're so not willing to drop a ton of cash on an outfit for every single one. Then what's a girl to do if she still wants to look good but, you know, not repeat outfits? Answer: Click on over to RSVP.ph and make a booking! 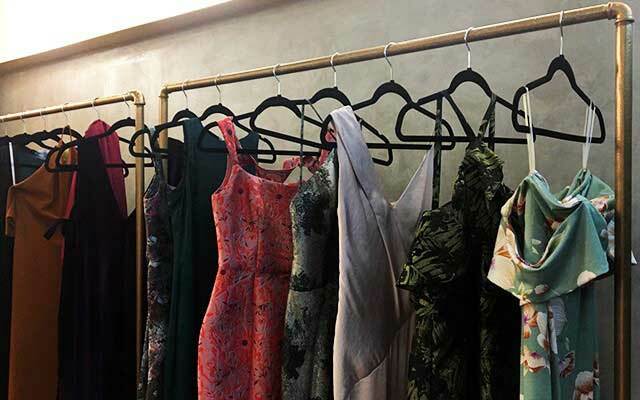 RSVP.ph, helmed by Cara Sumabat and Maica Salud (who double as the business' founders and in-house stylists, by the way), is Manila's first luxury eveningwear rental service that reconsiders "occasion dressing" into something easy and personal for every woman. Their company motto says it all in a nutshell: "Wear things once without regret every single time." Preview visited the studio one sunny afternoon for a chat with Cara and Mica on the importance of privacy, ironing out the kinks, and supporting local fashion. Read on! How did the whole concept of RSVP.ph begin? "Basically, we went straight to the designers and pitched to them the whole concept. We told them we needed quality dresses for rental but also emphasized that some girls just can’t come to you, because, number one, they don't have the time. Money’s not even the first thing! It’s more of the lack of time, and then number two is that they're shy. It's like, we just want to the bridge that gap between the clients and the designers and we also want to be able to have girls go to the designers understanding their individual aesthetics. Like we want them to really know that this is a Sassa Jimenez gown, like one look at it tells you that this is something she would make. "And you know these designers, they're artists! We want to make them feel that their craft is supported, acknowledged, and worn—the right way. "We've got a good response from our girls. Everyone who has come in, they're like, "Wow, I get to wear Martin Bautista!" Another good reaction is, "Who is this guy? I love his work, whoever he is. I’ve never heard of this guy, I've never worn him before." And from there we connect them, and now they're Martin B. girls! So it's fun. It's a nice community we are building." So all the designers on your roster are local? "For now yes, we really want to make them feel supported. "We want to start here, build that whole network and build this little community, and then from there, we want to grow as our girls will grow! We've been trying to do this for about a year now, and slowly, we are growing in terms of clients, so we also want to grow with what we're offering also. And I think by next year probably, we'll have international brands to bring in or international brands to work with." So how does collaborating with the designers work? 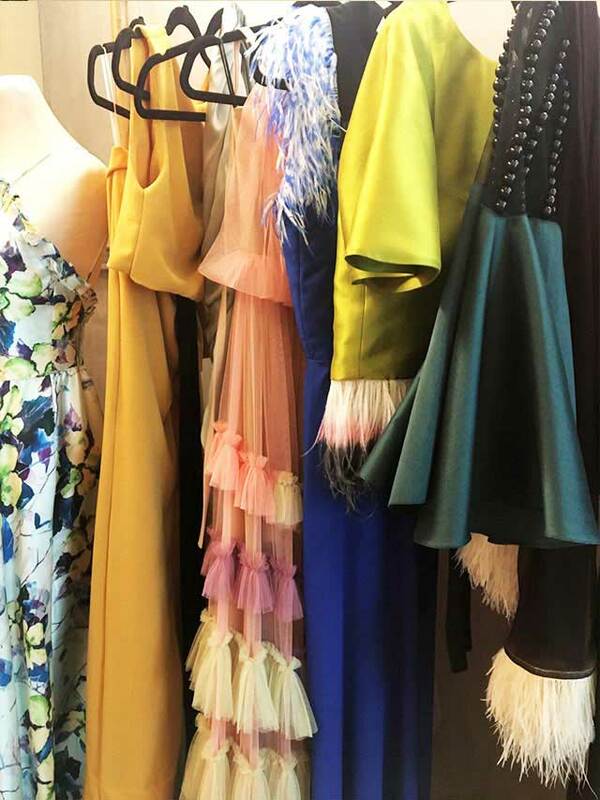 "We work on a collection together based on what we feel our clients need or respond to, so if they think of Martin they wanna wear silk, so we'll do some silk pieces with him, some draped dresses, or his signature skirts." The designs come from your end? "So we do that, and they consign their runway pieces and their archived samples that go to the press, which is nice because they have a good representation of their aesthetic here in the studio. Whenever people come in, we have this rack where we spotlight one of the designers. We have them on rotation, and we show all their runway pieces, so the girls get an idea of what a certain designer specializes in." How many designers do you have in your roundup right now? "Right now we have Martin Bautista, Sassa Jimenez, Stacey Rodriguez, and Vania Romoff. "We wanted to start with a good core first then build on that and slowly expand. We decided to start with just four because we're still growing and figuring things out, so we didn't want to contact everyone yet! Growing will also depend on what kind of clients we get in, so sometimes clients will come in and tell us who they like and who they want to see more of and it can still grow in that way. 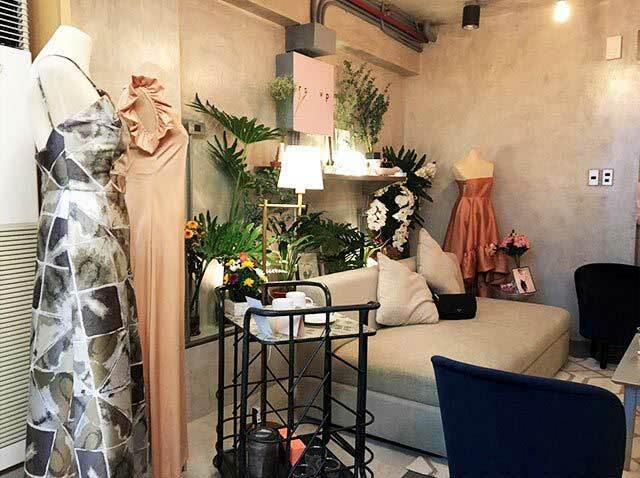 "We also want to give the designers the opportunity to meet these other new clients, because some girls have no idea who to go to, old and young, so we just try to bridge the gap. So imagine if a girl likes something in our studio from Sassa, they'll know na if they want something custom-made this time, they can go to her directly. It's really been happening! "It's also nice because, from last year, we've had a few girls who came in for the weddings of their friends and recently just got engaged themselves. So they go, 'okay, I'm planning my wedding, what do I do? Who does my wedding gown, my entourage, my maids of honor?' And we get to be a part of who they decide on. It's cool." So RSVP.ph is beneficial for everyone in the loop! "Yes! That's what we want to be able to do, and that's why we were saying na everything we're doing is with the growth of our clients and designer partners, so we want to grow with everyone in such a way that we kinda just help everyone and make things easier for them. "Also, there's just so many events, you know? Everyone is getting married, there are big corporate events to dress up for. I don't know how those corporate people do it, just because they work such long hours, and a lot of them don't even have Saturday completely free, so I don't know how they can find dresses and clothes for the things they have to do. Imagine awards ceremonies and the like. We cater to that need too, because a lot of them are being awarded for something they've been working hard on, so they deserve to look good for that thank-you speech onstage. We want them to have that magic moment because every girl deserves it. "But if they don't have time, then that's not gonna happen. We want to give them their Cinderella moment—when the clock strikes 12, you'll have to return your dress, but the point is you looked great, made an entrance, and had your moment. [laughs]"
So, at around how much does a rental begin? "Some girls have actually come for more than one event, so when they do come in, they'll need two or three dresses. 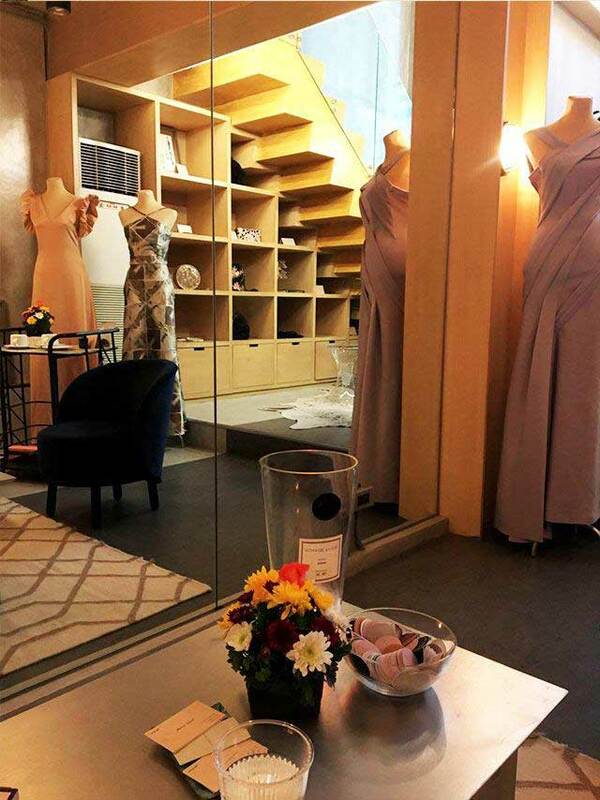 Isahan na because they simply don't have time to go for multiple fittings! They're working girls. They come in like, 'okay, these are the events in my calendar. I have one in May and one in June." So they'll reserve and fit na in one go, and we put that in the profile they make on our website and they'll simply get a notification online that their dress is ready." We heard you're also accepting consignments from girls who have unused dresses in their closets! How does that work? "So basically, we offer a partnership with other girls who have once-used dresses that are just sitting in their closets. You know how, after you wear a gown, especially if it was a super memorable night, you don't really want to wear it again just to preserve that moment? But it's in great condition and someone else would love to wear it? "What we do is we take in those dresses and find matches for them. Every time we get a match, you get a cut of the rental fee. "We offer that service and we keep everything confidential! Like, you'll know your dresses get rented out but you won't know to whom, and even on the other side, the client will never know who owns the gown. We make sure of that, because sometimes when you know, it removes the magic because you technically know that it's pre-owned. We take that away and just make everyone feel good." There's so much to the business behind the scenes! "Yes! It's a mouthful, everything we explained and all. The market is still getting used to it. We still get some girls who message and be like, 'how much for this dress? Can I order this dress? ', and we’re like, it doesn't really work that way! But now that our website is up—we launched it just two weeks ago!—we can direct them to the FAQs page which answers all their questions." And privacy is a huge part of the appeal, the magic. "Yes, definitely. It's a new concept, and that's why we also prefer that interviews about the business really be held in the studio so that you can see for yourself and really understand why don't just show the dresses online. They're very special, and we don't want to overexpose them. "For example, if you've seen this dress and we posted it on the site and then next week you see your friend wearing it, you'll be like, 'I know where you got this!'. And that takes away from the magic moment. "When you open that door and walk into the party, it's like the reveal, like hello, it's me! You can't spoil the grand entrance. [laughs] Sometimes it's not even about where you got the outfit, it's more of like, people have seen it somewhere. In fact, when you come in for a fitting, you won't see our entire inventory, just the pieces we handpicked for you according to the preferences you submitted as you made your booking on the site. It's very personal, very edited. 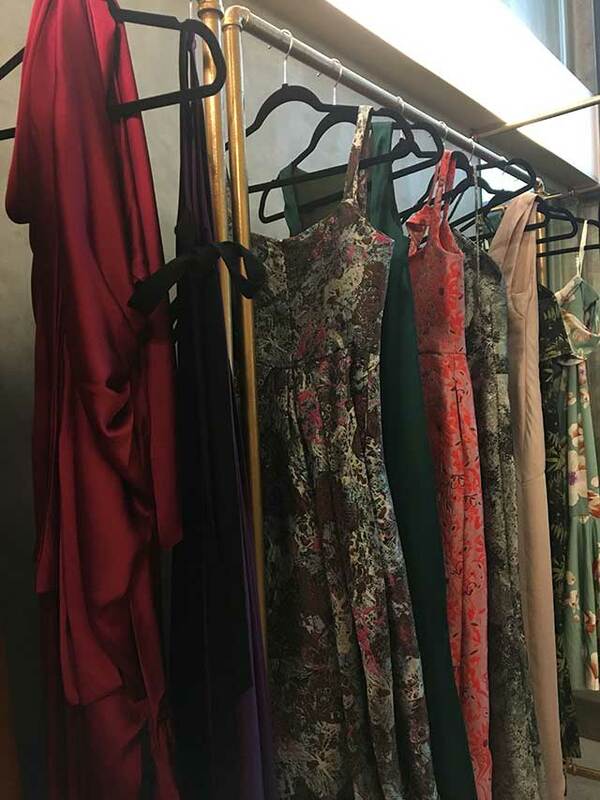 "And every time a new client comes in we try not to show the same dresses as we showed the last time, especially because their events change. 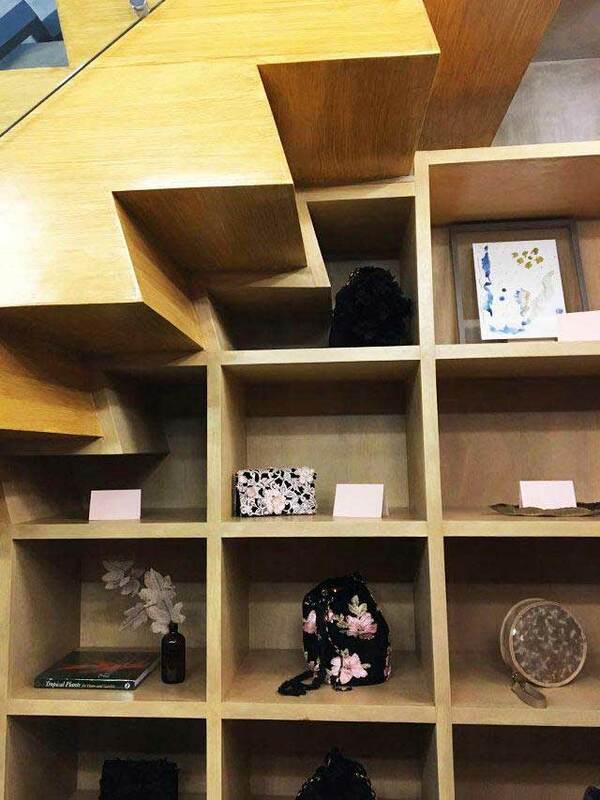 That's why it's important to fill in all the details in the fitting form!" Exactly when did RSVP.ph start by the way? "Officially this year, but we have been on a dry run since summer 2017! It took a while to figure it out—we just try to make everything so smooth that no one realizes that theres a lot of it going behind the scenes. Since we've been on a dry run, we've been receiving [feedback], and whether they're [from] friends, family, or girls via Instagram, we spent a year getting their feedback, so now I think we've ironed out all the kinks. With the website up and organized, now it feels like a seamless experience, and that's the goal. It's going great!"